Digital Lifestyle Outfitters (DLO) on Thursday announced it is shipping the TransDock micro, an FM transmitter and charger for the iPhone. It costs $70. The TransDock micro works in your automobile, drawing power from the cigarette lighter jack. 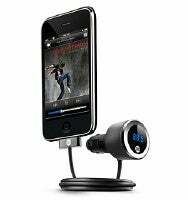 It tunes into any open FM radio frequency between 88.1 to 107.9 and lets you listen to the audio on your iPhone. The TransDock micro sports DLO’s “IntelliTune” technology, which scans for “open” (unused) FM frequencies and lets you save them instantly (up to four presets will be saved). A built-in display shows you the frequency it’s tuned to, so you can tune in that frequency on your vehicle’s radio. The TransDock micro incorporates a four-foot cable, so you can place the iPhone wherever you need to. The device plugs into the iPhone’s dock connector and charges its battery while it’s connected. The TransDock micro has received Apple’s “Works with iPhone” certification.